Photo courtesy of Trevor Ward. Visit www.trevorwardphotography.com for more examples of his work. To show your Florida vacation home in the best possible light there are a few inexpensive gadgets that will give you LOADS of photographic benefits. Many of us use our mobile phones as our primary camera. This is fine if you have a good quality camera built in. I do too. The cameras on the latest devices can take stunning photos. However, to take your photography to the next level, there are a few gadgets that will make your phone almost a professional tool. First, I’d recommend getting a wide angle adapter for your smart phone. Inexpensive versions can be had for under £10. Higher quality ones can be purchased for around £35 – £45. They will transform the lens of your camera into a wide angle lens, allowing you to photograph almost an entire room with one shot. Wide angle shots not only give the viewer a better perspective of the layout of the room, but also make the room look bigger than it really is. Second, I’d recommend a tripod. You can pick up a very inexpensive one for just £15. 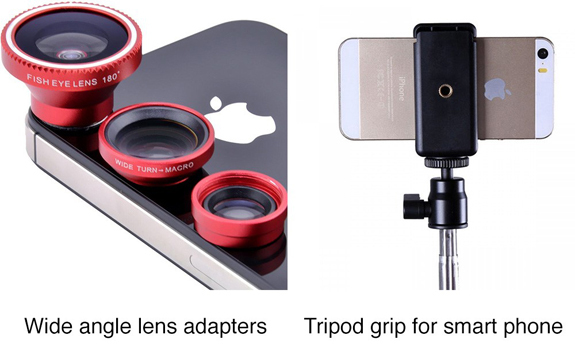 And for another £10- £15 you can get a grip that allows you to attach your mobile phone to the tripod. Why is the tripod so important? It eliminates the blurry images that are a result of shooting handheld, indoors. Inside homes, there often isn’t very much light. In order to compensate for the lack of light, the automatic settings on the camera will adjust the shutter speed to be slower. When it gets too slow, it’s nearly impossible to hold the camera steady enough to avoid motion blur. Putting your camera on a tripod guarantees a steady shot and a super sharp focus. Third, you can try different camera apps for your smart device. Some camera apps allow you to manually control the exposure settings on the camera such as shutter speed. 99% of my professional indoor shots are done with a long exposure (and low ISO). If you want to really step up your game, you can buy yourself either a DSLR or mirror-less camera that shoots RAW images. (Most smart phones shoot compressed jpg images.) These cameras and their lenses can be a considerable investment, but will yield fantastic results. I ALWAYS shoot RAW images when I’m getting paid for photography. RAW images allow for greater flexibility with exposure and colour. Which takes me to my next tip. Most smart phones and computers have photo editing capabilities built right in. 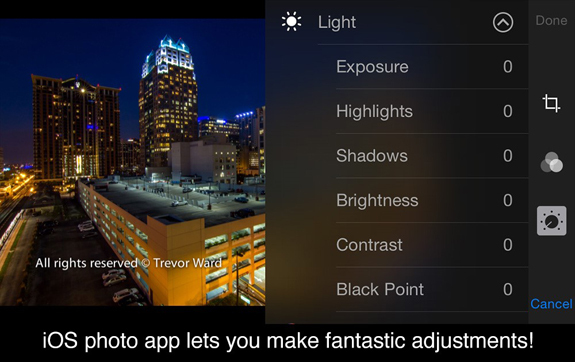 The standard photo app on my iPhone allows me to adjust the SHADOWS, HIGHLIGHTS, BLACKS and EXPOSURE. If I’m editing my professional photos, I’ll use a program by adobe called Lightroom. As long as your program allows you to control the SHADOWS, HIGHLIGHTS, BLACKS and EXPOSURE of your image (look for those specific words in your editor), then you’re good to go. In generally, you’ll want to increase the SHADOWS almost all the way. Then decrease the HIGHLIGHTS almost all the way. Lastly adjust the EXPOSURE and BLACKS until the picture looks good. With just a little practice you’ll be able to make your photos look stunning in just a few seconds each. Adobe’s Lightroom photo editing program – also available as an app for smart phones and tablets. Once you’ve invested in upgrading your equipment you’re ready to keep your marketing images updated at any time. If you decorate or update a room in your Florida vacation home them make sure you update the images on your listing too! There’s no reason not to experiment with your new skills . 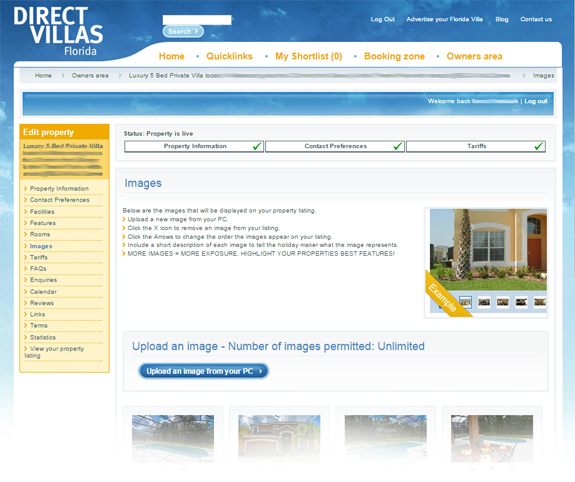 . . upload an unlimited number of images to your Direct Villas Florida listing via your Owners Area at no extra cost. So there you have it – 16 tips for taking great architectural photography covering staging, composition, lighting, equipment and editing. Now give it a go and try them for yourself. Sound like too much work? Or perhaps you’re not due to visit your home until later in the year? Then you could hire a professional who specializes in architectural photography and have the peace of mind knowing that your photos will be perfect. Trevor Ward is a professional architectural and interior design photographer based in Orlando, Florida, USA. He’s currently offering vacation home owners registered with Direct Villas Florida discounted rates starting from US $300 for one home (maximum size 2500 sq. 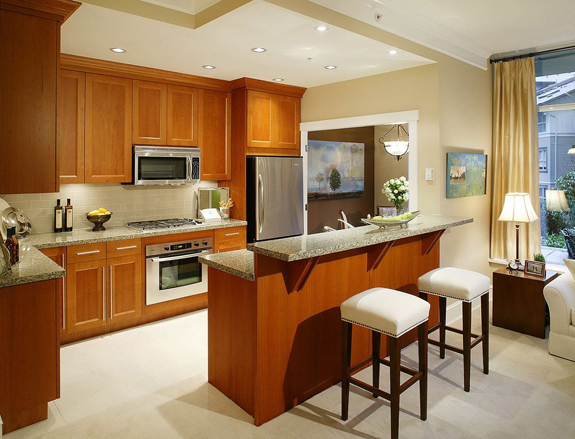 ft with no cleaning and minimal staging) or two houses from $500. To view some of his work visit www.trevorwardphotography.com. Trevor can be contacted via his website, or by email at trevor@redeyefilmco.com. Remember to quote your Direct Villas listing ID when contacting him. Whether you book the professional services of Trevor Ward Photography or follow the top tips in his two articles to take your own photos, then make sure you get your gorgeous new images uploaded to your Direct Villas Florida listing as soon as possible. We can’t wait to see them but more importantly – neither can your future guests! If you’d like to advertise your own home on www.directvillasflorida.com our listing package is available for just £120 per year. Contact info@directvillasuk.com for more information or call Sarah or Tracy on +44 (0)333 2400 797 to register today. This entry was posted on Friday, March 27th, 2015 at 6:46 pm	and is filed under Blogroll, General Advice, Marketing your Florida villa, Uncategorized. You can follow any responses to this entry through the RSS 2.0 feed. You can leave a response, or trackback from your own site.